“I always feel like somebody’s watching me. And I have no privacy.” – Rockwell’s song from the 80’s is turning into something Germans might relate to. While Germany is expanding its espionage powers and closely cooperating with foreign intelligence agencies, there is less and less privacy left for Internet users in Germany. If you don’t like the idea of being watched, using a virtual private network (VPN) is what you should be doing to protect your privacy without sacrificing Internet freedom. In October 2015, the Bundestag passed a law reinstating mandatory data retention as a measure to strengthen national cyber security. The law requires all German telecommunications and Internet service providers (ISPs) to collect and retain user metadata for up to 10 weeks. Metadata includes phone, texting and email communications data, as well as web browsing and download history. Also, service providers are able to see to whom you called and texted, when it happened and for how long. When it comes to the Internet usage, your IP address serves like your online ID by which your ISP can form your behavior-based digital footprint – a profile disclosing pretty detailed info about you. And, according to the data retention law, the collected metadata can be accessed with a government warrant. Bundesnachrichtendienst (BDN), the Federal Intelligence Service of Germany, has been reported to be closely cooperating with foreign intelligence agencies, such as the American NSA. The BDN has helped the NSA to spy on Europeans, including Germans. Moreover, Germany is a member of the 14 Eyes alliance, which functions as an expanded composition of the 5 Eyes – Australia, Canada, New Zealand, the UK and the US – countries cooperating in surveillance operations. Peer-to-Peer (P2P) is a convenient way to share large files, such as data sets, open-source programs or public domain videos, quickly. Regardless of your reasons for distributing or downloading files via P2P networks, you should keep in mind that Germany has very strict laws regarding illegal sharing of copyrighted content. The supreme court is empowered to require ISPs to hand over contacts of Internet users who infringe the law uploading or downloading copyrighted content. Since using services such as torrent automatically makes you a distributor of the file you’re downloading, many P2P users often end up receiving a letter from lawyers asking to pay hundreds of euros as a copyright infringement fine. Attention, gamers! Not all online games are available in Germany due to licensing agreements or censorship bans. So if you keep getting your access denied, the easiest option to bypass such restrictions is using VPN to play a game in Germany. The same rules apply for streaming TV shows and other media that is unavailable in Germany due to geo-blocking. It’s the common issue for expats: let’s say you live in the US and have a subscription for a media streaming service, but after moving to Germany you can no longer access its content because of geographical restrictions. It can be pretty frustrating to lose your favorite shows, especially when you are paying for the service. VPN stands for a virtual private network that reroutes your Internet traffic through a remote server located in a selected country. It hides and replaces your IP address, so your online activity is no longer visible to your ISP. Using a VPN client in Germany protects you from the Internet surveillance and metadata collection, so you can always stay private whenever going online. Whatever are the reasons of using P2P networks for file sharing, VPN keeps you on a safe side by hiding your IP address. If you’re an expat living in Germany and don’t want to lose access to your favorite shows, VPN can make you feel like you never left home – all you have to do is connect to a VPN server in your home country. Moreover, a VPN client, like NordVPN, encrypts your Internet traffic with military-grade security protocols, so your personal information becomes inaccessible to hackers and identity thieves. There are many great cafes with public WiFi in the cities of Germany that make for ideal places to do some work remotely. However, public hotspots are extremely vulnerable to hacker attacks, so it’s very unsafe to share your sensitive data, such as banking details or ID, over these networks without VPN. Is VPN legal in Germany? In Germany, using a VPN client itself is legal, but the copyright infringement is not. Choosing to download, distribute or stream copyrighted content always comes at your own risk. What is the best VPN to use in Germany? When choosing a VPN client to use in Germany, it is recommended to look at least at these two criteria: a VPN service provider should not be located in a 14 Eyes country and it should not keep any logs of user activity online. 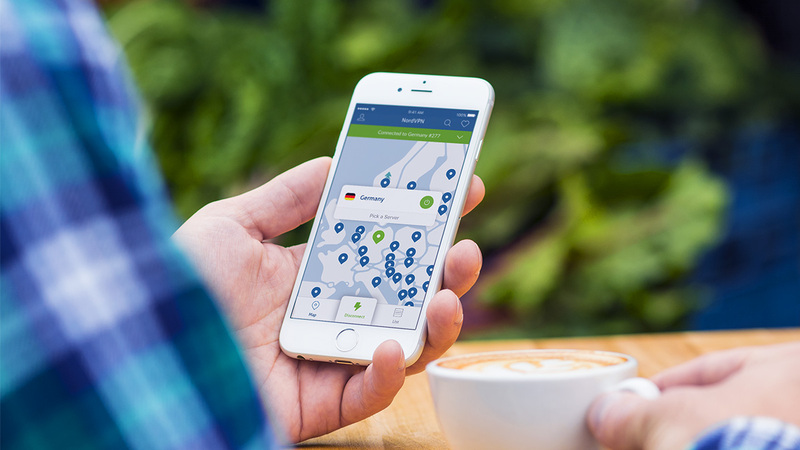 NordVPN is a great choice for those who value privacy, want to browse securely and access their favorite entertainment content from Germany. NordVPN is away from the jurisdictions of member countries of the 14 Eyes, commits to 100% zero log policy and offers a decent list of 5148 servers in 60 countries. To sum up, while surveillance practices differ from country to country, hackers and identity thieves don’t pay attention to the physical location when selecting their targets. This means that you should protect your privacy no matter where you are. Germany, with its powerful intelligence agencies, is no exception. If you don’t like the idea of being spied on, VPN is definitely a must-have for you.